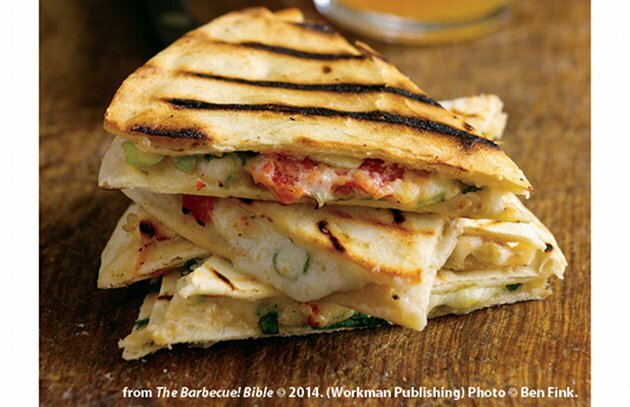 The quesadilla burst onto America’s culinary landscape in the 1990s. It was love at first bite. We loved the earthy-flavored, chewy-crisp tortillas, the gooey filling of melted cheese, the sting of the jalapeños. In true American fashion, we made Mexico’s “grilled cheese sandwich” our own, piling on chicken, duck, shrimp, even lobster. Makes you wonder if some of the more extravagant versions still contain cheese. In much of Mexico, quesadillas are actually cooked on a comal (flat skillet) or in hot oil or lard in a deep fryer. But there’s one region in Mexico where these grilled cheese sandwiches really are still grilled over a wood or charcoal fire, and that’s in the ancient Zapotec capital of Oaxaca. To experience the Mexican quesadilla at its most basic, head to the central food market in the village of Tlacolula, a 45-minute drive from downtown Oaxaca. Like most Oaxacan markets, this one has a “barbecue alley.” It’s a place where you buy meats, vegetables, tortillas, and other ingredients for grilling and where charcoal-burning grills blaze between the stalls for customers to use free of charge to cook these ingredients for lunch. That’s where I experienced the most primal quesadilla of all—one of the large, round bluish corn tortillas for which Oaxaca is famous, softened over the charcoal, then strewn with a few strands of Oaxacan string cheese, and folded in half to make a turnover. The grilling time took seconds, not minutes—just long enough to brown the tortilla and partially melt the cheese. Serve with salsa verde and you’re in business (and very likely in heaven). At the other end of the spectrum stands the tlayuda that accompanies grilled steak at the restaurant Casa Oaxaca in the historic colonial center of Oaxaca city. Tlayuda originated as a street snack—a pan-fried tortilla topped with beans, cheese, tomato, avocado, and salsa—eaten open face, like an Oaxacan pizza. But here chef-owner Alexandro Ruiz folds it in half and grills it over a charcoal fire, adding a smoky dimension and fire-crisped crust you simply won’t find in the street food. Next time you visit Oaxaca, be sure to reserve a table on the rooftop terrace—Ruiz serves some of the most sophisticated twists on traditional Oaxacan food in Mexico. Make the tlayuda, an Oaxacan grilled quesadilla. Flour has become the default tortilla in the U.S., but in Mexico, most quesadillas are made with corn tortillas. Extra points (and flavor) if you can buy freshly made corn tortillas from a bakery or shop in a Mexican neighborhood in your area. Warm the tortilla on the grill to soften it. When working with large tortillas, fill one side and fold in half, like a turnover. 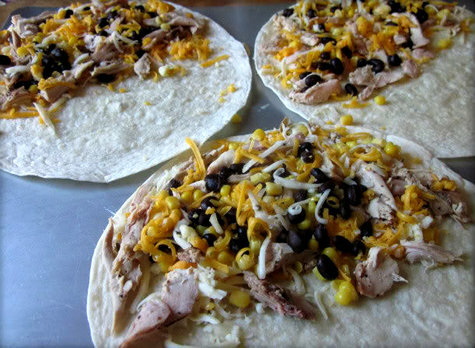 When working with small tortillas, pile one atop the other, placing the filling in the center like a sandwich. Coarsely grated or shredded cheese melts faster and more evenly than sliced cheese. Added advantage—when using grated cheese, you can mix several cheeses, like mild Jack and sharp cheddar. Other great quesadilla fillings include sliced fresh jalapeños, thinly sliced scallions, diced tomatoes, sautéed squash blossoms, etc. Quesadillas are normally grilled dry, but a light brushing with melted butter or olive oil adds extra flavor and helps crisp the tortilla without burning. Better yet, use pork drippings or bacon fat. Tortillas burn like paper. Work over a moderate fire and establish a fire-free safety zone on your grill where you can move the quesadilla if it starts to burn.